On this day in Duluth in 2014, the ski jump known as “Big Chester” was removed from Chester Park. 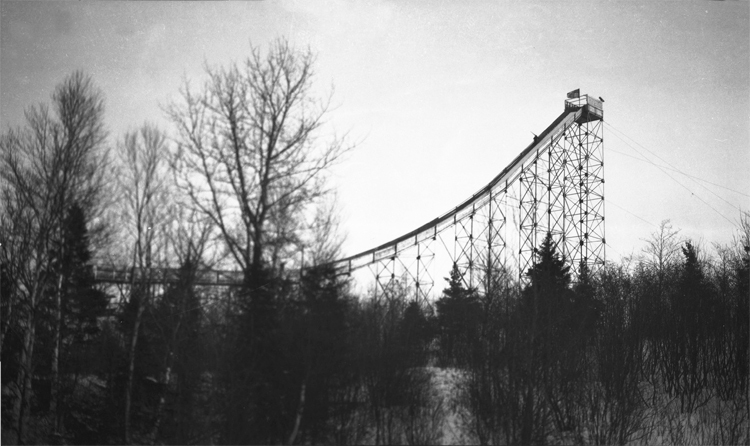 When it was first built in 1926 by the Duluth Ski Club, the structure was the largest steel ski jump ever constructed; it was soon nicknamed “Big Chester,” which had been the name of a wooden ski jump built in Chester Bowl just a few years earlier. Enthusiasm for ski jumping had declined dramatically by the 1990s with the advent of many other forms of extreme sports that attracted the same thrill seekers that ski jumping once did. Chester Bowl hosted its last ski jumping competition in 2005. In 2007 the Duluth Parks and Recreation Department announced it was considering removing the historic Chester Park ski jumps and surrounding facilities—the city had long viewed the jumps as a potential liability. Many fans of the ski jumps showed up to a meeting of the city’s Parks and Recreation Commission. Jim A. and Jim J. Denney proposed a plan allowing the former Duluth Ski Club members and others to try to save the jumps. The commission passed it unanimously, but no plan ever materialized. On August 18, 2014, Little Chester was torn down. Workers pulled down what remained of the 1926 Big Chester ski jump two days later. While the landmarks symbolized Duluth’s epic contributions to American ski jumping, for many years they had become a popular and dangerous spot for underage drinking among high school and college students who often climbed the sides of the jump. Read more about the history of ski jumping at Chester Park here and here.